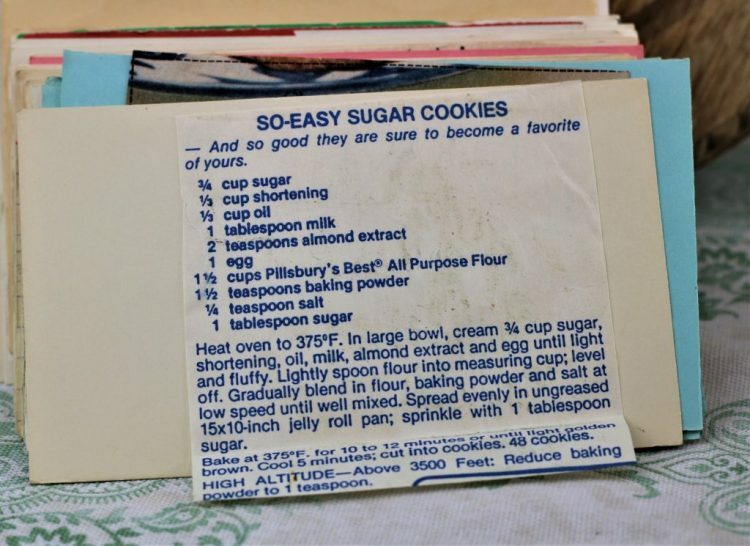 There are lots of fun recipes to read in the box this recipe for So Easy Sugar Cookies was with. 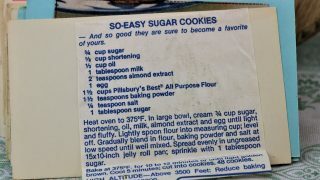 Use the links below to view other recipes similar to this So Easy Sugar Cookies recipe. If you make this So Easy Sugar Cookies recipe, please share your photos and comments below! Heat oven to 375°F. In large bowl, cream ¾ cup sugar, shortening, oil, milk, almond extract and egg until light and fluffy. Lightly spoon flour into measuring cup; level off. Gradually blend in flour, baking powder and salt at low speed until well mixed. Spread evenly in ungreased 15x10-inch jelly roll pan; sprinkle with 1 tablespoon sugar. Bake at 375°F. for 10 to 12 minutes or until light golden brown. Cool 5 minutes; cut into cookies. HIGH ALTITUDE - Above 3500 Feet: Reduce baking powder to 1 teaspoon.